My roommate from college is a video game designer now, but he was always a big video game guy. Back in the days of Ramen Noodles, Pabst Blue Ribbon, and The Legend of Zelda: The Ocarina of Time, we used a kind of shorthand. Whenever one of us would have to call our parents for money, we’d express relief later by saying, “my meter was getting low.” The simplified operational features of video games – like a “life” meter that alerts you to your character’s impending demise – helped us form a common vernacular; a user-friendly way to talk about much more complicated things. So it goes in Ligature Marks, the latest from Gideon Productions. 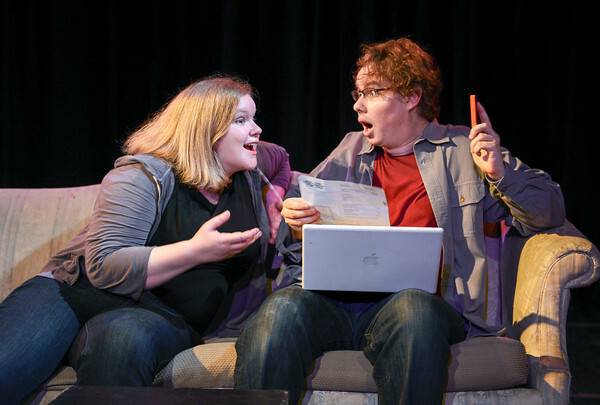 Infused with equal parts Noir-ish cynicism and perky humor, Mac Rogers’ gutsy play makes full use of the Brick’s Game Play Festival to explore the ways people use video games to talk about real life. 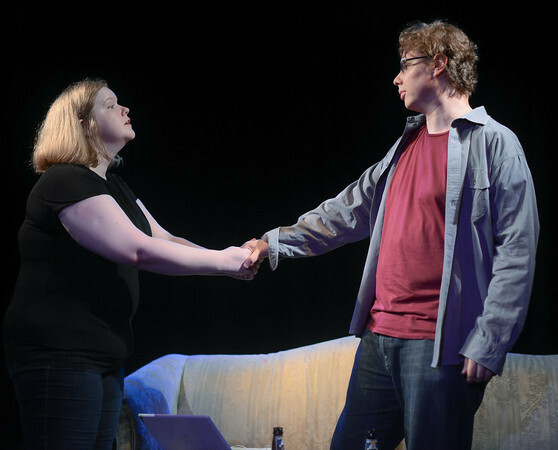 Likewise, director Jordana Williams’ finely tuned staging sees the minimal production values as an excuse to play fast and loose with the rules of suspension of disbelief in a way that wouldn’t be possible in a full-scale Gideon production. The final leg of the play in particular, which is well fortified by emphatic performances from Rogers himself and Rebecca Comtois, captivated me in ways I wasn’t prepared for. I usually try to avoid spoilers in these reviews, but since the production’s most daring aspects are built into the plot development, I can’t really avoid them. So, consider yourselves warned spoilerphobes. At the top of Ligature Marks, we are introduced to Terry (Rogers) and Jill (Comtois), who are arguing even before we see them. Terry and Jill were a couple once upon a time, until Terry got fed up and extorted some money in hopes of using it to escape from her. Instead he got caught and went to a minimum-security prison for two years. Rather than take offense, the lovesick Jill took a chance and moved into an apartment near Terry’s prison. Upon his release, he found her waiting for him and was easily lured back to her apartment with promises of the two things every man needs to survive: beer and high-speed internet. So even before things get a little crazy in Ligature Marks, Rogers neatly inverts the idea of women who want their men to be more driven and ambitious. Jill plainly wants no such thing, but Terry, with his constant justifications of why she shouldn’t be with him, seems to resent her for not wanting it. His simmering resentment and her blind devotion will pave the way for the darker plot swerves on the horizon, but along the way there are some bright spots for Terry and Jill and a lot of humor. In a crucial scene, Jill finally takes an interest in Noir, and Terry gives her an enthusiastic tutorial on the structure of the game. As the title suggests, the game is populated with sleazeballs, femme fatales, and other types typical of the Noir genre, some of whom the player must murder for love or money. 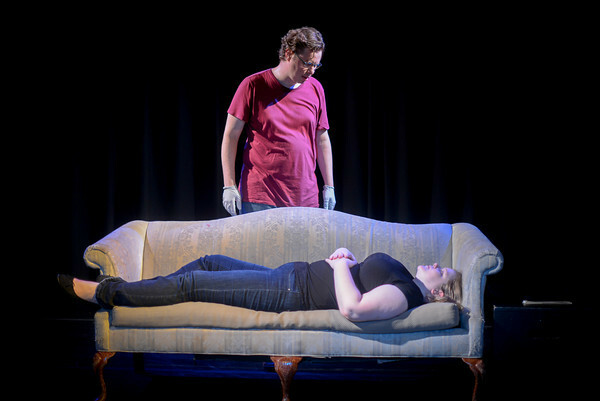 However the real challenge of the game, according to Terry, comes after the murder, like when the player must successfully cover it up in “Level 2.” The game then – with delightful absurdity – jumps ahead to a third level a number of years later, after the player has settled into a quiet, happy family life, and must suddenly confront his past mistakes again. Not long after this charming little scene, which momentarily ignites the flickering spark of attraction between these characters, a heated argument inspires Terry to walk out the door. Jill stops him, saying that he should just kill her, because without him she would essentially just lay down to die. Too much time on the Noir game inspires Terry’s initial response, a dismissive joke wondering how he would get rid of her body, but then, WHAM. In an astounding and abrupt narrative shift, he and Jill suddenly become co-conspirators in the planning of her murder. It’s a sharp turn, one that surely would have sent a lesser play careening through the guardrails, but Rogers – who has literally turned robots and aliens into people and people into monsters onstage – understands that wild detours like this can work if they are earned. At this point, he has taken pains to establish that Jill will do just about anything to make Terry happy, including act as accessory to her own murder. As this bizarre scheme is hatched, the staging becomes looser. Terry and Jill choose Jill’s downstairs neighbor, Craig, as a patsy for the crime, and go as far as “rehearsing” for Jill’s interactions with Craig. Terry stands in for Craig, while Jill practices seducing and then picking a fight with him, so the neighbors can hear them yell, thus implicating Craig in the murder over Terry. But here’s the thing – at some point the boundaries Terry’s “practice” version of Craig give way. It suddenly seems that Rogers is actually playing Craig and we are simply seeing the Jill/Craig encounter happen in front of us. Rogers, Comtois, and director Williams execute this stunningly subtle transition, which is akin to the cinematic trick of intercutting the prep for a heist and the heist itself, with impressive nonchalance. This fluid approach works especially well within the confines of a minimal festival production, and stylishly surmounts the time and space limitations of a two-person play quite remarkably. The encounter with Craig goes as planned, and then, in the same heightened style, we see Terry murder Jill as planned. I had wondered going into Ligature Marks what connection it might share with its immediate predecessor, Frankenstein Upstairs. It turns out it was the moment when Terry methodically snaps on the latex gloves as he prepares to strangle the peacefully waiting Jill. A familiar shiver ran through me, similar to the one I got during Vic’s calm sexual assault on the unconscious Marisol while the drugged Sophie looked on, helpless. Except this time, because of the intimacy of the action, it feels like we are Sophie. 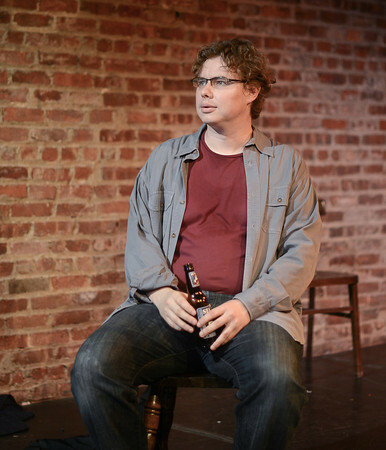 The rest of the play follows the “levels” outlined in Terry’s explanation of the Noir game. In Level 2, Terry must navigate a pointed interrogation from a sharp detective played by Comtois. And just like the game, Terry finds himself living the dream years later in Level 3, working a cozy consulting job in Oregon and romancing his bonafide femme fatale bosslady Piper (also Comtois), when a grim reminder of his past – literally a zombie version of Jill – shambles back into his life. In the final moments, Terry faces a choice: does he continue his new life with Piper or take responsibility for what he has done. He chooses the latter, and immediately we are back in Jill’s apartment and Piper turns out to have been Jill all along. Apparently the “rehearsing” never stopped; we have not been watching these events actually play out. Everything from the encounter with Craig on has been Terry and Jill working out what could potentially happen if he had decided to go through with the murder. A sneaky ending like this will always incite anger initially. I’m sure there are some who won’t be able to swallow such massive reversal (or re-reversal). Zombie Jill was a bit much for even me, but on balance, I appreciate the endings execution and I applaud its point. Comtois and Rogers bring superb depth to their later roles and director Williams stages the action with such careful opacity that it doesn’t feel like a cheat. Most importantly, the only viable reading of the ending is that this fantasized Noir caper has been nothing more than a prolonged discussion. Just like me and my college roommate, the simplified structure of Terry’s game has given him and Jill a new – and very strange – way to talk through the issues of obligation and guilt in their relationship. Thanks to this simulation, Jill and Terry understand that both their lives and futures hinge on how they treat each other now. Maybe, having experienced all this, these combative lovers will finally find a way to work it out. Or at least a way to keep their life meters at a respectable 50%. Presented by Gideon Productions as part of the Game Play Festival at The Brick, 579 Metropolitan Avenue, Williamsburg, NY. Through July 27. (866) 811-411 or www.bricktheater.com.